The progression of the story in book three is very satisfying. In book one, most characters were very comfortable in their roles, and felt powerful, even invincible. This was true for many of the characters in book two, as well. That is not the case in book three. The constant war throughout the Seven Kingdoms has put everyone on edge, and changed alliances regularly. Betrayal and treachery are not newly discovered, but the avenues to achieve them are innumerable. Tyrion, the Imp, continues to be central part to the story. Throughout the series his cunning has been his best weapon. In A Storm of Swords, this becomes even more important for him because he can no longer rely on the vast resources of the Lannisters to provide incentive to those who would do his bidding. Jon Snow also has a strong arc in A Storm of Swords. As a character that has not inherited the regal birthright so many others have, he is free to make more interesting choices, and lead the story in many new directions. His journey beyond the Wall into the lands of the wildlings provides a respite from ongoing affairs of state. A Storm of Swords is a satisfying installment for readers of the series. 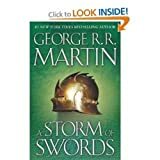 With the weight of the first two books behind it, the landscape and the people of the Seven Kingdoms provide the reader with a comfortable familiarity. This level of comfort makes the story more enjoyable, because even the smaller details are significant. Observing how many times a sword changes hands, or which new outlaws are running an inn helps the story to feel whole. If your family has betrayed you and you’re on the lam, read A Storm of Swords. Martin, George R. R. A Storm of Swords. New York: Bantam Books, 2000. Kindle edition.